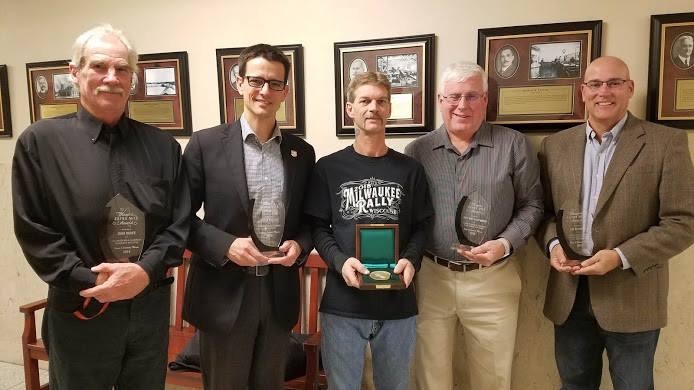 Carnegie Hero James Williams, center, received the Carnegie Medal from Green Bay (Wis.) Mayor James J. Schmitt during a council meeting on Oct. 16. Williams told Schmitt that it “still breaks my heart” to think about his act, in which he helped rescue a 17-month-old boy from attacking dogs outside Williams’s city home on June 20, 2016. One of the dogs, an adult pit bull, dragged the boy from his stroller and bit onto his head. Williams, then 47, punched that dog to free the boy from it, then restrained a dog that had bitten the boy’s mother. Pictured with Williams are others that Schmitt recognized that evening for their contributions to the Green Bay community.